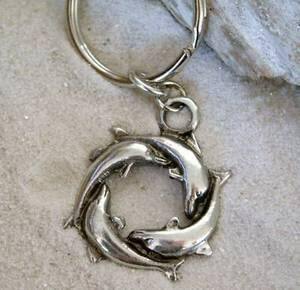 Style Keychain Ornament 16" Leather Necklace 18" Leather Necklace 24" Leather Necklace Cotton Cord 16"- 30"
This Lovely Circle Dolphin with 4 playful swimming Dolphins Keychain is handcast and hand-finished in solid American Pewter with a shiny finish resembling antiqued sterling silver. The Key Ring is the classic split ring and measures 1 1/4 inch or 32mm. All of our pewter is lead free, nickel free and cadmium free...Made in the USA.